Shhhh, don't tell the kids I spent the morning bowling! Yes it was good but now I feel sick! Shall we play spot the difference? Notre-Dame and surrounds, Saigon style. The impressive Notre Dame Cathedral was built by the French between 1863 and 1880 and features two bell towers, reaching a height of 58 meters (190 feet). All the original building materials were imported from France. Tiles have been carved with the words Guichard Carvin, Marseille St André France. Some tiles are carved with the words "Wang-Tai Saigon". Many tiles have since been made in Saigon to replace the tiles that were damaged by the war. There are 56 glass squares supplied by the Lorin firm of Chartres in France. Le Place Pigneau de Behaine, the square in front of the cathedral, holds a beautiful statue of the Virgin Mary. During October 2005, the statue was reported to have shed tears, attracting thousands of people and forcing authorities to stop traffic around the Cathedral. However, the top clergy of the Catholic Church in Vietnam confirmed that the Virgin Mary statue did not shed tears. Never let the truth get in the way of a good story I say. There is ALWAYS someone getting their wedding photos taken here. Usually 3 or 4. Very popular and you can see why. Just to the right of the cathedral is the the beautiful Central Post Office, one of the best looking colonial public buildings in Ho Chi Minh City. The building was constructed when Vietnam was part of French Indochina in the early 20th century. It has a Gothic architectural style which was designed and constructed by the famous architect Gustave Eiffel (thats pronounced "eye full" Nicole....in joke...sorry) of Eiffel Tower fame and has become a tourist destination in its own right. Everyones favorite Uncle, Uncle Ho. Yes I am well aware that that is a lot of wine...thank you. As the blog title suggests, it has been a very busy couple of days! Yesterdays main achievement was to go indoor plant shopping. I paid 3 million dong for 3 big palms, 2 medium sized I don't know whats, 5 small I don't know whats and 1 magnificent Bonsai. It sounds like a lot but in actuality it is about $190 Aus. Not bad considering that includes delivery and beautiful pots. I cannot believe the difference it has made to the apartment! It looks fantastic. The 3 big palms are in the lounge area. The 2 medium are in the bar area (yes, we have a bar area), the 5 small are in the bathrooms and the bonsai sits proudly in the middle of the dining table. I also went out this morning to fill the house with Orchids. It may sound decadent but at 10,000 dong a stem (63 cents) it is well worth it. The last lot lasted nearly 3 weeks. So for $8.80 there are flowers in the lounge and also my bedroom. Not just flowers...orchids! Who has flowers in their bedroom? How lucky am I? I also went out today to get some pebbles to put over the bottom part of the plants to hide the dirt and keep the moisture in. I guess the most extraordinary thing about all of this is that it is not as easy as popping into Bunnings. I had to find a plant supplier, find my way there, troll through a mini urban jungle and then negotiate in my very limited Vietnamese. A great sense of achievement. Todays missions were a bit of an adventure but with a little more help. I had the maintenance guys come up and hang all of our photos which again, has really added to the homely feel of the place. I had Quyen, Lena the cleaner, the 2 photo hangers and the 3 air-conditioning repair men in the apartment and they all gathered around to ooh and ahh over the pictures. It was quite a moment and I can only imagine how they view our adventures through China, East Timor, Italy, Greece etc. We must seem so rich! (mind you, all fun and games until Lena said I was fat in some of the photos...they do call a spade a spade here and unless you are a size 8 you are a hippo....but that is another blog!) I then went out and was introduced to a framing guy who is going to frame some paintings I bought in Cambodia. I then also bought 5 clocks. Strange I know but all will be relieved. I have blatantly stolen a brilliant idea from the gorgeous Tan and can I just say...wait till tomorrow when I post some pics! Nick has gone out tonight. When I explained to Quiddy that Daddy had to go out he gave me a lesson in "he does not have to go out....he WANTS to go out....there is a difference". That kid is so switched on. Better go and get these kids to bed. Standby for the pictures of the fruits of my labour, even if it was a labour of love! If Australia has Vegemite and meat pies, Vietnam has Pho. Pronounced "Fur" it is a Vietnamese beef and noodle soup. Usually eaten at breakfast, the soup includes noodles made from rice and is often served with basil, lime, bean sprouts and peppers that are added to the soup by the consumer. 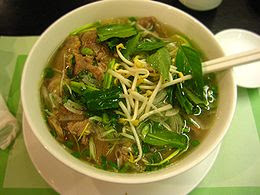 Phở is served in a bowl with a specific cut of white rice noodles (called bánh phở') in clear beef broth, with thin cuts of beef (steak, fatty flank, lean flank, brisket). Variations feature tendon, tripe, meatballs, chicken leg, chicken breast, or other chicken organs. "With the lot" (made with chicken broth and all or most of the shop's chicken and cattle offerings, including chicken hearts and livers and beef tripe and tendons) is known as phở đặc biệt ("specialty phở"). The broth is generally made by simmering beef (and sometimes chicken) bones, oxtails, flank steak, charred onion, and spices, taking several hours to prepare. Seasonings can include Saigon cinnamon or other kinds of cinnamon as alternatives, star anise, roasted ginger, black cardamom, coriander seed, fennel seed and clove. Vietnamese dishes are meals typically served with lots of greens, herbs, vegetables and various other accompaniments such as dipping sauces, hot and spicy pastes, and flavor enhancements, such as a squeeze of lime or lemon. 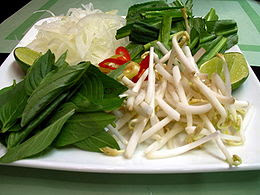 The dish is garnished with ingredients such as green onions, white onions, coriander, Thai basil (húng quế), fresh Thai chili peppers, lemon or lime wedges, bean sprouts, and cilantro (ngò rí) or culantro (ngò gai). Scarletts birthday present from Quyen. Scarlett is indeed a very lucky girl to receive her very first Ao Dais from Quyen (our house keeper/cook/nanny/ domestic goddess) for her birthday. It is a stunning shade of pink...her favourite! here is a little history on the Ao Dais. A lasting impression for any visitor to Vietnam is the beauty of the women dressed in their ao dais. Girls dressed in white pick their way through muddy streets going home from school or sail by in a graceful chatter on their bikes. Secretaries in delicate pastels greet you at an office door and older ladies in deep shades of purple, green or blue cut a striking pose eating dinner at a restaurant. The ao dai appears to flatter every figure. Its body-hugging top flows over wide trousers that brush the floor. Splits in the gown extend well above waist height and make it comfortable and easy to move in. Although virtually the whole body is swathed in soft flowing fabric, these splits give the odd glimpse of a bare midriff, making the outfit very sensual. Rapidly becoming the national costume for ladies, its development is actually very short compared to the country's history. Pronounced 'ao yai' in the south, but 'ao zai' in the north, the color is indicative of the wearer's age and status. Young girls wear pure white, fully lined outfits symbolizing their purity. As they grow older but are still unmarried they move into soft pastel shades. Only married women wear gowns in strong, rich colors, usually over white or black pants. The ao dai has always been more prevalent in the south than the north, but austerity drives after 1975 meant it was rarely anywhere seen for a number of years as it was considered an excess not appropriate for hard work. The nineties have seen a resurgence in the ao dai's popularity. "It has become standard attire for many office workers and hotel staff as well as now being the preferred dress for more formal occasions. For visitors, the pink and blue of the Vietnam Airlines uniform creates a lasting memory as they travel. During the 1950s two tailors in Saigon, Tran Kim of Thiet Lap Tailors and Dung of Dung Tailors, started producing the gowns with raglan sleeves. ( Dung tailors is known by expats as the Suit Nazi.....very business like and not a particularly pleasant experience...but great suits!) This creates a diagonal seam running from the collar to the underarm and today, this style is still preferred. This is a small street pretty much around the corner from us. You find that a lot of streets will have a lot of the same kind of stuff bunched together in one area. This is the case here. All things sporting can be found here. It is the way we walk to Penny and Johns house so we walk up there quite often. Nick is in the shop buying some soccer strips for Jem and the kids are waiting patiently outside. The last shot cracks me up because whether they know it or not, this is how many if not most Vietnamese people sit when they have no chair. To them, it is so comfortable. To Nick and I it is joint inflaming. To the kids? Just natural I suppose. Perhaps they have turned Vietnamese already!! !